Overview - A work of poetry and dark humor, Les visiteurs du soir is a lyrical medieval fantasy from the great French director Marcel Carné. 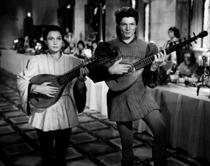 Two strangers (Arletty and Alain Cuny), dressed as minstrels, arrive at a castle in advance of court festivities—and it is revealed that they are actually emissaries of the devil himself, dispatched to spread heartbreak and suffering. Their plans, however, are thwarted by an unexpected intrusion: human love. 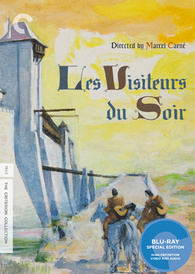 Often interpreted as an allegory for the Nazi occupation of France, during which it was made, Les visiteurs du soir—wittily written by Jacques Prévert and Pierre Laroche, and elegantly designed by Alexandre Trauner and shot by Roger Hubert—is a moving and whimsical tale of love conquering all. Bullets and blades might easily pierce the skin, but there is perhaps no greater weapon in all the world than love. Capable of wounding, inspiring, manipulating, and in some rare cases, even conquering all, love remains one of man's most devastating tools and greatest weaknesses. 'Les visiteurs du soir' features characters that appear to be very well aware of these facts. At the cruel bidding of their devious master, they use charm and deception to corrupt the heart. But what happens when deceit becomes sincerity? A magical tale full of fantasy, treachery, and storybook romance, 'Les visiteurs du soir' probes the dark, tragic mysteries of love, exposing the sentiment's bittersweet strengths and flaws. Set in 1485, the story follows two mysterious minstrels named Dominique and Gilles (Arletty and Alain Cuny), as they arrive upon the castle of Baron Hugues (Fernand Ledoux). Unfortunately for the Baron and his people, Dominique and Gilles are not the harmless bards they claim to be. Instead, they are actually the devil's envoys who have been sent to torment the castle's inhabitants through deception and desire. After discovering that the Baron's daughter, Anne (Marie Déa), has just become engaged, the devious duo set their goals upon disrupting her nuptials. While their plan seems to work for a time, the pesky fortitude of the human heart complicates matters, prompting the emissaries' infamous employer to step in -- but in the face of true love, could the devil finally meet his match? A likely influence on the later works of Jean Cocteau ('Beauty and the Beast,' and especially 'Orpheus'), the film features an enchanting fantasy tailored for adults. The narrative is rife with rich thematic material that tackles concepts of jealousy, lies, lust, corruption, and genuine romance. As the devil's messengers manipulate their targets, the writers start to blur the line between sincerity and deceit. The devastating thrall of false passion takes hold, twisting and contorting the human characters like puppets on a string. But in a clever twist, it's revealed that these demonic tormentors might not be completely immune to their own tricks. Classic ideas of good versus evil are examined with wit and intelligence, and while the film's take on true love borders on the melodramatic, the movie's finale avoids a traditional, idealized happy ending. Love might prove victorious, but that triumph comes with a certain degree of tragedy and irony, enriching an otherwise simple fairy tale with layers of depth. Arletty and Alain Cuny are perfect as the seemingly heartless pair of anti-cupids. They tease and exploit their victims, but they don't ever appear to truly relish their deeds. In fact, a tragic past is hinted at for both, and it's clear that their unnerving, icy stares only serve to mask deeply wounded hearts. Unfortunately for Dominique, it seems that those scars are too ingrained to ever heal, and Arletty reveals a truly unsettling callousness to her character's unsavory deeds. On the other hand, Gilles is another story altogether. What starts out as a mere façade of love for Anne grows into something more, and Cuny handles the conflicted transformation with brooding intensity. In the role of Anne, Marie Déa exudes beauty, innocence, and determination, making it easy to see why Gilles falls under her spell. With that said, she's much more than just an object of desire or a damsel in distress, and the character ultimately proves to be a formidable opponent for any challenger -- even the devil. Of course, special mention must also go to Jules Berry who steps into that devious role. Gaudy and fueled by a child-like glee for mischief, Berry's interpretation of the Prince of Darkness is amusingly light -- while still maintaining an undercurrent of genuine menace. As Dominique and Gilles carry on with their plan, they use magic to manipulate their prey, and acclaimed French director Marcel Carne likewise uses subtle cinematic "conjuring tricks" to bring their supernatural deceit to life. While the film's aesthetic can actually be rather restrained and matter-of-fact, there are impressive splashes of fairy tale style peppered throughout. Slow motion imagery creates an ethereal, dream-like atmosphere, and simple cuts and dissolves give way to impossible transformations and relocations. The film's medieval production design is also beautifully realized, adding a fantastic but still believable sense of time and place. One particularly memorable sequence follows Gilles and Anne as they take a nighttime stroll through a garden. As Gilles seduces the innocent woman, time itself is literally frozen around them, enriching the drama and mood through fantasy. Even beyond the film's more overtly wondrous visuals, Carne brings an effective air of modest poetry to his images. Simple setups are enhanced through extended takes, deliberate camera movements, and dramatic shadows that cascade over characters' faces, intensifying the movie's romantically somber tone. While the script and characterizations are quite strong, there are some minor shortcomings here and there. The narrative does drag in spots, and certain threads feel a little unfinished (an abandoned coda for Dominique and Baron Hugues is actually mentioned in the supplements). The appearance of Jules Berry's character at the halfway point does inject some welcome amusement into the proceedings, but his antics prove to be a bit meandering. Likewise, the film's final scenes start to go in circles, and the conclusion is a tad abrupt. Of course, these really are minor nitpicks, and as a whole, the storytelling and filmmaking are marvelous. It seems one can only play at love for so long before those emotions take on a life of their own, and as Gilles discovers, the consequences can be both sublime and devastating. A mature fairy tale marked by strong characterizations and bittersweet insights, 'Les visiteurs du soir' offers some poignant musings on the human heart. A romantic fantasy centered on the innocent and damned alike, it's a film that even the devil surely can't resist. Criterion presents 'Les visiteurs du soir' in their standard clear case with spine number 626. The BD-50 Region A disc comes packaged with a booklet featuring an essay by critic Michael Atkinson. The film is provided with a black and white 1080p/AVC MPEG-4 transfer in the 1.33:1 aspect ratio. While there are a few age related issues, this is a strong presentation that preserves the film's imaginative visuals well. The source print is in pretty good shape with a light layer of natural grain, but there are periodic scratches, specks, and vertical lines. Some very minor contrast pulsing and image stabilization issues are also apparent, but are never distracting. The film's earliest scenes tend to be the roughest, but with the exception of a few shots here and there, the presentation cleans up nicely. 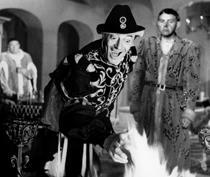 Clarity is good, revealing a pleasing sense of texture and detail in the medieval production designs and costumes. With that said, the photography does have a fairly soft quality to it (particularly in wide shots), and many scenes seem to exhibit an intentionally dreamy glow. Likewise, isolated portions of some shots appear slightly blurry. Contrast is high with bright whites and deep blacks. 'Les visiteurs du soir' isn't as pristine as some other classic titles from Criterion, but it still looks quite lovely in high dentition. There are some periodic signs of damage, but they're relatively minor and the cinematic integrity of the images is respectfully maintained. The audio is presented in a French LPCM mono track with optional English subtitles. Though limited by its age, this is a faithful mix that does the film justice. Dialogue can sound a tad muffled, but music and effects display decent range and fidelity. The minstrel songs come through well, though there is an inherently thin quality to the mix. Balance between the audio elements is handled nicely and I did not detect any notable signs of pops, crackles, or background hissing. Respectful but limited, this track is on par with most mono presentations from the era. Free of any major signs of distortion or other technical issues, the movie sounds about as good as it can. The Making of Les visiteurs du soir (HD, 37 min) - Presented in upscaled 1080i with French Dolby Digital 1.0 sound and optional English subtitles, this is a documentary about the film's production. Featuring interviews with film archivists, historians, and journalists, the doc traces the movie's production and release. Details on the director's earlier films and aborted projects are provided along with information about the film's scripting, production design, music, casting, and themes. A heavy emphasis is placed on the difficulties of shooting movies in France during the German occupation, and lots of interesting historical trivia is covered. Informative but a little dry, this is a solid making of that's certainly worth a look. Trailer (HD, 4 min) - The film's trailer is presented in 1080p. 'Les visiteurs du soir' is a bittersweet, romantic fairy tale that examines the great strengths and dangers of love. Director Marcel Carne sprinkles the film with splashes of cinematic magic, and the story is nicely layered with poignant themes. The video isn't quite pristine, but the transfer is authentic and very strong regardless. The audio is solid, but does demonstrate some inherent limitations. While this is a comparatively slim release from Criterion, the making of documentary is worthwhile. 'Children of Paradise' might be Carne's masterpiece, but 'Les visiteurs du soir' is still a great piece of filmmaking, and this disc certainly gets my recommendation.